HUBER HEIGHTS — Huber resident Aaron Hostetter didn’t have to think long when his wife Sarah approached him about increasing their family by one by participating in Choices In Community Living’s Shared Living (foster care) program. All he had to do was remember the 11 foster homes he was in as a child before he was finally adopted. He already knew Jonathan Rogers, who prefers to be called J.D., through Sarah’s work. Sarah works at the Choices home where J.D. lived with three other young men. J.D., too, knew what it was like to live in foster care and not to feel like you are part of a real family. He cared about his staff and his housemates, but there was always his dream of what it would be like to have his very own family and very own home. 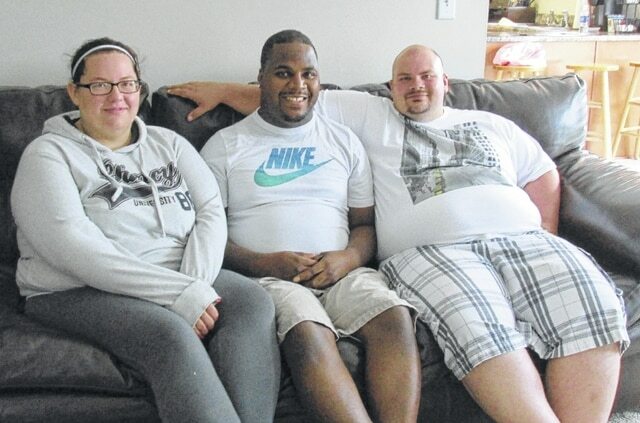 Aaron and Sarah moved into their spacious home in Huber Heights less than six months ago. Soon after they moved in, they began the lengthy process to add J.D., who is 26-years-old, to their family. J.D. has lived with his new family for a little more than a month now. In his new home he has his own room with his own television. He helps take care of the family’s three dogs. He is learning to help mow the grass and work with Aaron on his truck. He’s learning a lot about wrenches. He works at Sam’s Club and contracts for his transportation to and from work. Support for J.D.’s new life decision is one of the ways that Choices In Community Living assures that the dreams and goals of people with autism, cerebral palsy, Down Syndrome and other developmental disabilities are met. The nonprofit agency has homes and other services in Huber and throughout Montgomery, Clark, Madison and Preble counties. In addition to their homes in Huber, they also partner with the Y at the Heights, which hosts their Fun-Fit program. They are celebrating their 30th year of community-based person-centered services and supports. Choices In Community Living is a member of the Huber Heights Chamber of Commerce. J.D had a good life in his Choices home with his housemates, but he wanted something he felt he had been missing. He wanted his own family. Through the Shared Living program, that dream became a reality. The program consists of matching individuals with developmental disabilities with a family who is willing to open their doors and expand their family. The program provides the foster care family with a competitive, reliable stipend per day, paid vacation and respite days, training, certification and ongoing support, home study, placement and paperwork management. J.D. has found more than Aaron and Sarah; he found an entire family. “He’s been accepted by our large clan on both sides,” said Aaron. And what a clan it is. In addition to Sarah working at Choices, her sister Shelby Klennert and her husband Riley also work there. Aaron’s sister Carrie Hostetter and cousin Brittany Tankersley, also work for the agency, as does his brother Kenny Cooksey. Even before J.D. joined the family, Aaron’s parents had become involved with the young men at the Choices home where J.D. was living, making sure each of them had gift cards at Christmas. J.D. has new goals in his life to go along with his new family. He wants to take a cooking class. He’s learning how to budget his own money. The three of them together are beginning work on a Life Book for him that will include photographs and other items. It may have taken 26 years but the wait has been worth it. J.D. now has a family and home all his own. There is never a happier person than one whose dream has at last come true. Aaron and Sarah couldn’t agree more.